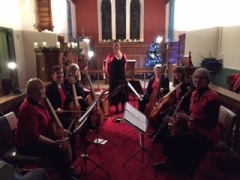 Celebrating the Old Manx Christmas for Knockaloe by candlelight – in the company of local group Hartes Ease who specialize in 16th and 17th century Renaissance music. We were honoured when group member, Cristl, suggested the group perform a concert in aid of the Knockaloe charity. Cristl (pictured right, introducing the evening) has a personal link with the camp where her Great Uncle was interned during WW1. However it wasn’t until she was married and living in Peel, when her father told her about her Great Uncle having being interned just down the Road. 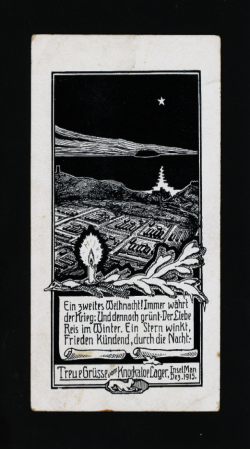 Harte's Ease provided absolutely beautiful music as part of a thoughtful programme which sought to reflect the internees, their guards and the Manx workers at the camp, as well as perfectly encompassing the festive period. The evening received wonderful feedback and Harte’s ease told us how very pleased they were to have helped raise awareness of the Charity and its work as well as helping to raise a fabulous £776.45 towards the renovation of the historic Patrick Old School to create the Knockaloe Visitors Centre. The setting of Patrick Church by candlelight was perfect, being adjacent to the area of Patrick churchyard where the internees created "camp 5", for those internees who would not return home. But the evening was actually a celebration, reminiscent of the many concerts the internees themselves had held at Knockaloe 100 years ago. The evening was broken up by appropriate interval refreshments, including warming alcoholic and non-alcoholic Glühwein utilising the Manx produced Mull Syrup of Staarvey Farms to a traditional family recipe; and our traditional German and Austrian biscuits were all homemade and received lovely comments. Especially the cinnamon stars! All recipes will be added to our website events page in time for our next festive season. 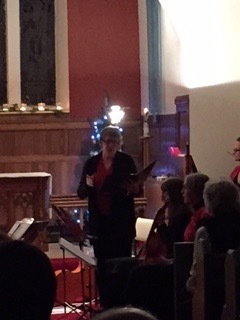 Many thanks also for the articles by Valerie Caine who attended January's concert performed by Hartes Ease. Her great articles on http://www.isleofman.com/lifestyle/giving/knockaloe/ and in the North Western Chronicle help to promote our work, and thanks also to the North American Manx Association, www.transceltic.com and www.culturevannin.im for sharing the article via their websites and newsletters http://manxmusic.com/media/Newsletters/KMJ%20February%202017.pdf Such organisations help the voluntary community project based in Patrick to reach out to people on and off island who may have information which we can bring together back at Knockaloe. We should also like to reiterate our thanks to Green's Tearooms, Harbour Lights, Coffee Republic and Craftworks Studio, Silverdale, for donating excellent raffle prizes, and to Patrick Church for the warm, and cosy and entirely appropriate venue. And of course to the wonderful people who came along and supported the evening. The support of you all is greatly appreciated - thank you.